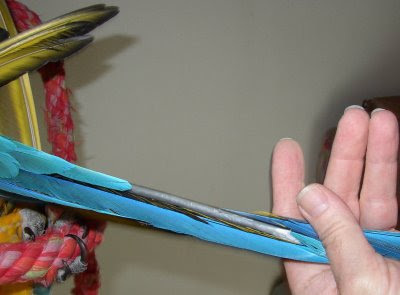 Our blue and gold macaw Aboo is molting. Aboo dropped a 24 and 1/2 inch long tail feather today. 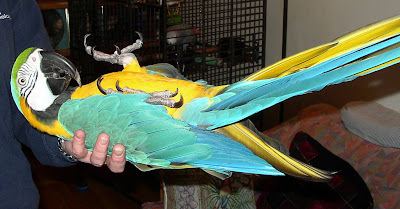 He's making room for a new tail feather rapidly coming in. 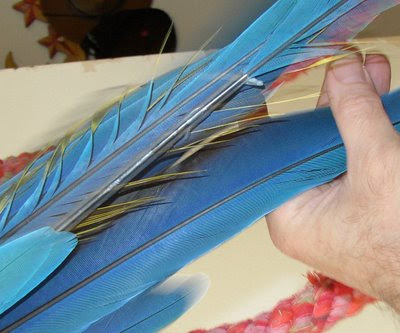 Just check out the size of the sheath protecting the new feather. How'd you like to have something that size sticking out of your rear end? Aboo was extremely uncooperative when we helped him remove the sheath. It was like he was being murdered or something!